Theatre for Creativity, The Navhind Times Planet J’s workshop on theatre was held on Sunday, June 26 at Dempo House, Panaji. Specifically designed for those between the ages of 13 to 19, the workshop aimed at familiarising young people with theatre as a form of art. It also introduced the participants to the basics of theatre, with special emphasis on the role of the creative imagination, collaborative processes and effective communication. 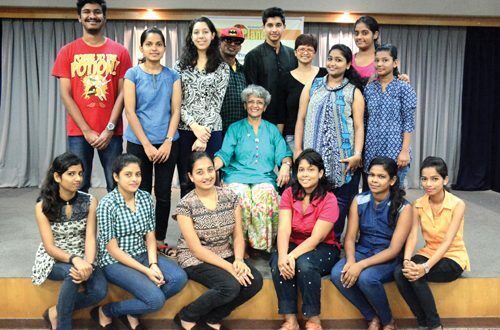 Conducted by playwright Isabel Santa Rita Vas, the half day workshop commenced with an introduction to theatre as an exciting collaborative art, and the benefits of learning theatre skills. Exercises, mimes, skits and more were included into the meticulously planned sessions. The warm up exercises that followed included walking around started at a leisurely pace and then built up to a tempo where the participants were literally running. Besides dispelling the lethargy brought about by the pouring rain, the exercises also gave the participants, who were now wide awake, a taste of what was to follow. The use of voice through greetings and fun words was introduced in these exercises. To test the flexibility of movements, participants were made to imagine their body to be made of different materials like wood, metal, mud, plastic and by using their body joints they depicted each material very creatively. In the next exercise emotions like joy, sorrow, surprise, fear and excitement were illustrated through facial expression, voice and the entire body. Under the topic of theatre space, participants explored the possibility of using space creatively. They learnt to use various levels of space, and look at their surroundings as theatre spaces, as they created dynamic and original presentations miming animal movements and various forces of nature like water, fire, wind and water. The fertile imagination of participants came to the fore in story improvisation whereby each group created small stories, improvised characters and relationships and included elements of conflict and resolution into the plots. The settings included a market scene, a police station, a playground and a bus stand. To explain the role of the director in a play, Vas entrusted each group with the task of creating group sculptures which gave participants an opportunity to experience what the director is required to do on stage. Leadership emerged as the workshop progressed and fun exercises were undertaken. Demonstrating the influence of powerful non-verbal communication, each group created fluid sculptures with performers moving very creatively from one concept, like war, to its opposite, peace with ingenuity. Coordination of thought, movement and performance was clearly displayed throughout each exercise. Fun, laughter and creativity marked the extremely interactive workshop which ended with Vas handing out certificates of participation.